The man and woman who are sealed for eternity under the authority of the holy priesthood can, through their faithfulness, attain exaltation in the celestial kingdom of God. While serving as a Counselor to President John Taylor, Joseph F. Smith traveled to Hawaii with his wife Julina, who he said was “as true as steel; as constant as the pole star, as faithful as time and better than gold.”1 In Hawaii President Smith suffered from a serious illness and Julina nursed him back to health. Several months later, in March of 1887, it became necessary for Julina and their children to return to the mainland while Joseph F. remained on the islands. God instituted marriage for our eternal glory and exaltation. 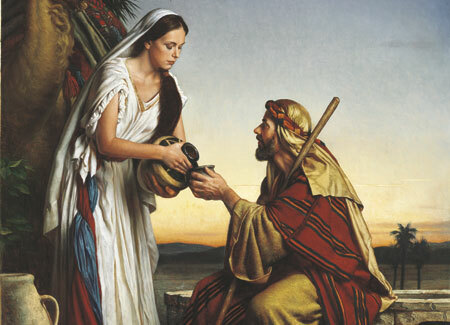 Rebekah at the Well, by Michael Deas. Abraham’s servant sought a wife for Isaac, son of Abraham, among God’s covenant people. Rebekah drew water from a well for the camels of the servant, thus fulfilling his prayer that he would be led to find a righteous young woman. It is a glorious privilege to be united as man and wife for time and all eternity. Marry in the faith, at the appropriate time, and in the house of the Lord. … This loss to the home is a loss the nation must feel, as years go on. Time will vindicate the laws of God and the truth that individual human happiness is found in duty and not in pleasure and freedom from care. Marriage should be built upon principles of love and sacred devotion. For what purposes was marriage instituted by God? How does eternal marriage enable us to realize our “highest and holiest aspirations”? Why is marriage “most vital to the happiness of mankind”? Why is it regarded as unimportant by many? How do eternal increase and eternal happiness depend on the eternal union of man and wife? How does it make you feel to know that you will have claim on your husband or wife for all eternity? Why should we seek to marry in the temple? What might be the consequences to ourselves and to others of breaking the bond of the new and everlasting covenant of marriage? What allurements or distractions might lead some people to postpone or avoid marriage? How can we know when it is appropriate for us to marry? President Joseph F. Smith prophesied that the shirking of the responsibilities of marriage is a “loss the nation must feel, as years go on.” How are nations now feeling this loss? How can the covenant of eternal marriage strengthen couples when they face “their obstacles and their difficulties”? Why is “absolute trust” between husband and wife important? What other attributes should be cultivated between husbands and wives? How do negative behaviors—such as criticism, sarcasm, failure to forgive, and pride—weaken marital relationships? What does it mean for a husband and wife to be one? What sacrifices might couples need to make to become one? What other things can couples do to strengthen their eternal union? Life of Joseph F. Smith, comp. Joseph Fielding Smith (1938), 453. Quoted in Francis M. Gibbons, Joseph F. Smith: Patriarch and Preacher, Prophet of God (1984), 153. In Conference Report, Oct. 1911, 8. Gospel Doctrine, 5th ed. (1939), 272. In James R. Clark, comp, Messages of the First Presidency of The Church of Jesus Christ of Latter-day Saints, 6 vols. (1965–75), 4:147. “Discourse by President Joseph F. Smith,” Millennial Star, 15 Feb. 1900, 98. “Editor’s Table: Marriage God-Ordained and Sanctioned,” Improvement Era, July 1902, 713; paragraphing altered. Deseret News: Semi-Weekly, 10 Sept. 1878, 1. In Messages of the First Presidency, 4:250. “Editorial Thoughts: The Righteousness of Marriage, and Its Opposite,” Juvenile Instructor, 1 July 1902, 402. In Conference Report, Apr. 1905, 84–85. “Sermon on Home Government,” Millennial Star, 25 Jan. 1912, 49–50. “Editor’s Table: Marriage God-Ordained and Sanctioned,” 717–18.